Posted December 7th, 2013 by Gerry La Rocca & filed under Canadian Economy, International Business Operations. The World Trade Organization has forged a deal that could add $1 trillion to the world economy. It’s aimed at cutting red-tape to help poorer countries sell their goods to wealthier nations. A deal to boost global trade has been approved by the World Trade Organization’s 159 member economies for the first time in nearly two decades, keeping alive the possibility that a broader agreement to create a level playing field for rich and poor countries can be reached in the future. WTO Director-General Roberto Azevedo shed tears during the summit’s closing ceremony Saturday as he thanked host nation Indonesia, WTO member countries and his wife. 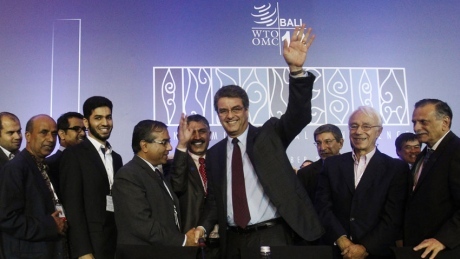 Trade ministers had come to the four-day WTO meeting on the resort island of Bali with little hope that an agreement would be reached after years of inertia in trade negotiations. “This week has been about high-level diplomacy, long nights and considerable drama,” said Indonesian Trade Minister Gita Wirjawan, who chaired the meeting. “But it has also been about ensuring that the gains of the multilateral trading system reach our small businesses and our most vulnerable economies.”subsidy limits, shelving the issue for negotiations at a later time. The centrepiece of the agreement reached in Bali was measures to ease barriers to trade by simplifying customs procedures and making them more transparent. The deal could boost global trade by $1 trillion over time and also keeps alive the WTO’s broader Doha Round of trade negotiations, sometimes known as the development round because of sweeping changes in regulations, taxes and subsidies that would benefit low income countries. Azevedo said the WTO will spend the next year developing a fresh approach for moving forward with the Doha negotiations. “The WTO has re-established its credibility as an indispensable forum for trade negotiations. Nor is this a paper victory: Streamlining the passage of goods across borders by cutting red tape and bureaucracy could boost the world economy,” the U.S. Chamber of Commerce said in a statement. The idea behind the WTO is that if all countries play by the same trade rules, then all countries, rich or poor, will benefit. 2. Should anti-corruption measures be put in place at ports and border crossings? 3. Simplifying custom procedures, is this enough to help poorer countries trade their goods?